The Together for Biodiversity Awards are an opportunity to celebrate the work being carried out by individuals and communities across Ireland to protect our natural environment. Have you or your community been involved in a project to help protect local wildlife or habitats this year? Perhaps you; planted a school wildlife garden, made your village more pollinator friendly or helped protect a local wetland. If so, why not enter the Together for Biodiversity Awards to have your work recognised and be in with the chance to win funding for future biodiversity projects. Individuals, community groups, schools and farmers are all invited to apply. 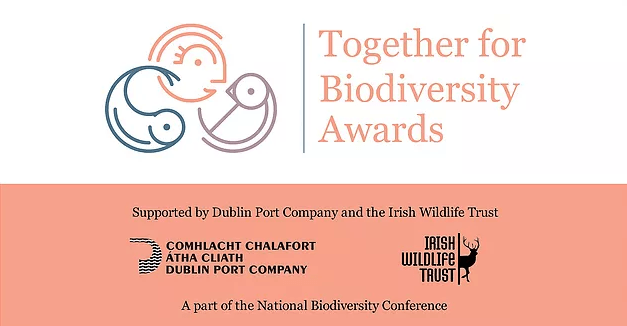 The Together for Biodiversity Awards are part of the National Biodiversity Conference, which takes place at Dublin Castle on 20th and 21st February 2019. The award winner will be announced at the National Biodiversity Conference. The National Biodiversity Conference is being organised by the National Parks and Wildlife Service and the Irish Forum on Natural Capital. These awards are kindly sponsored by Dublin Port Company. (Schools leading on biodiversity projects through education). All other finalist will receive €500 vouchers to use for biodiversity projects.